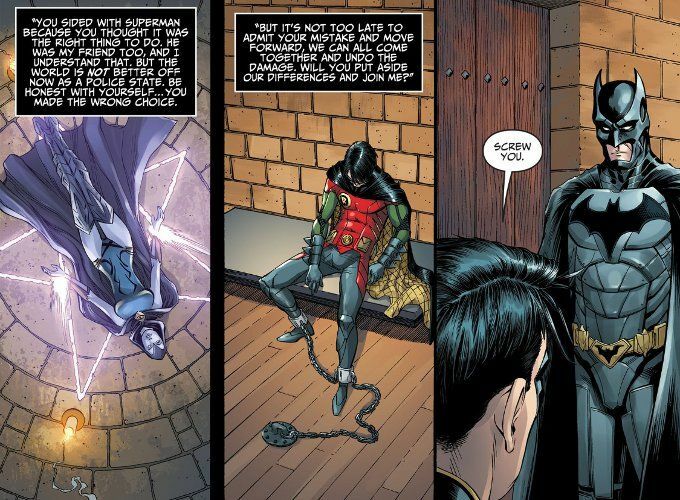 Injustice: Gods Among Us - Year Three #15 is a problematic comic for a number of reasons. None of these are the fault of writer Brian Buccellato, who I fear has taken over the writing duties on this series at the worst possible moment. For this issue centers upon the return of Wonder Woman, whose portrayal was one of the few bad things about both the Injustice video game and the Injustice comic books. 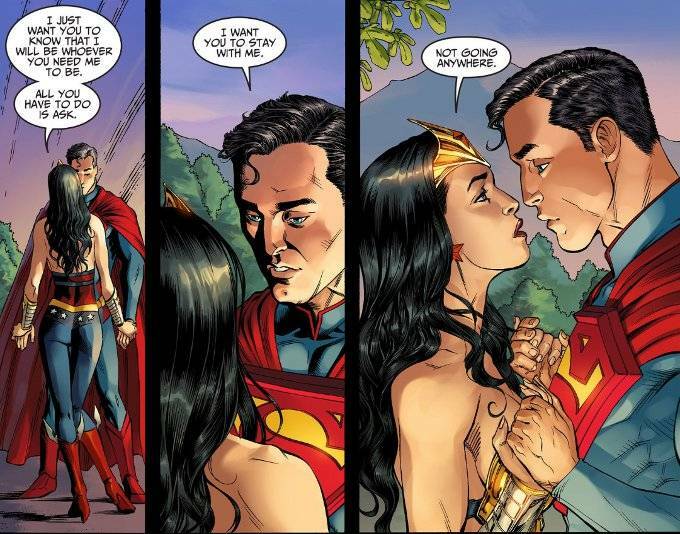 As problematic as the idea of Superman going mad with power and taking over the world was for some readers, the Wonder Woman of the Injustice universe proved a more bitter pill to swallow. This Princess Diana was simultaneously a war hawk who wished to force peace upon the world and a simpering co-dependent who wanted nothing in the world more than Superman's love. To say that both of these ideas are anathema to the core of what Wonder Woman should be is an understatement! The opening of the book is a prime example of how badly Wonder Woman is portrayed in the Injustice universe. In the last two issues, we saw Superman's dreams of a perfect world as he was trapped in magical slumber. He dreamed of a world where he was happily married to Lois Lane, they had a daughter who was better at being a superhero than he was, the world was at peace and he finally had some time to relax and enjoy a simple life. What is Wonder Woman's dream of a perfect life? Being on a beach alone with Superman, as he talks about how beautiful the sun is, how he wishes everyone could see it as he sees it with his super senses and how the sun isn't quite the most beautiful thing he's ever seen as she tells him she will be whatever he wants her to be with a devotion that can only be described as slavish! The hell of it is that Brian Buccellato writes all of this well and Superman's speech about the sun is a damn good speech, evocative of Grant Morrison's similar writings on how Superman must perceive the world. But that doesn't change the fact that this portrayal of Wonder Woman is deeply flawed and owes more to Frank Miller's portrayal of the character than Gail Simone, Greg Rucka or indeed any other writer who has ever worked with Wonder Woman! Despite this one glaring problem, the issue is still a good one. As Diana is brought up to speed on how things have changed while she's been gone, so too are the readers informed of the current status quo as we see how things stand with Superman's captured allies and Batman's resistance movement. All of this is awesomely illustrated by the always outstanding Mike S. Miller and J. Nanjan. Is this issue of Injustice a step down from what we've seen recently? Yes, but it has nothing to do with the creative team and everything to do with the universe itself. Hopefully Brian Buccellato can find some way of turning around Diana's portrayal so that it matches the rest of this series in terms of quality. As is, this is still a book to watch but it is one I may be watching through a side-eyed glance.